Many space enthusiasts have long hoped to build a base on the moon, but the lunar surface's harsh environment wouldn't be an ideal place for humans to thrive. 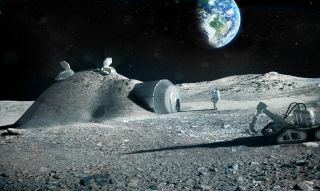 The idea of building a lunar outpost has long captured people's imaginations. But what would it really be like to live on the moon? Space exploration has long focused on the moon, with Earth's satellite the setting for a number of significant missions. A 1959 Soviet spacecraft photographed the moon's far side for the first time, and in 1969, NASA landed people on the lunar surface for the first time. Numerous missions followed, including NASA's Lunar Reconnaissance Orbiter that beamed home the highest-resolution topographical lunar map to date, covering 98.2 percent of the moon's surface. Life on the moon would be very different for explorers than life on Earth. See what it living on the moon would be like in this Space.com infographic. "About the only place we could build a base that wouldn't have to deal with these extremes is, oddly enough, near the lunar poles," said Rick Elphic, project scientist for NASA's LADEE probe, which studied the moon's atmosphere and dust environment before performing a planned crash into the natural satellitein April 2014. These areas likely store vast amounts of water-ice and enjoy low levels of light from the sun for several months at a time. "Instead of the blazing heat of lunar noon, it is a kind of perpetual balmy sunset, with temperatures around 0 degrees Celsius [32 degrees Fahrenheit] due to the low angle of the sun," Elphic added. Vacations away from pole outposts would offer up sights unlike anything on Earth. Decorating the moon's vast lava plains are large impact-borne "mountains," the tallest of which is 3.4 miles (5.5 kilometers) high, about the size of Mount Saint Elias on the border of Alaska and Canada. "Skylight" holes puncture some of the plains where lava likely drained into sub-surface caverns — the perfect adventure for lunar spelunkers. The moon also sports huge craters, such as the 25-mile-wide (40 km) Aristarchus crater. A view from the rim of Aristarchus would "dwarf the Grand Canyon and make Meteor Crater in Arizona look like a hole in a putting green," Elphic told Space.com via email. Humans could set up robot-constructed mining outposts at the moon's poles. See how a moon colony could work here. Another dazzling sight on the moon would be a solar eclipse, which occurs when the Earth blocks the sun. From the moon, the Earth would appear as a ring of red-orange light that dominates the sky. And though the moon is on average a whopping 238,855 miles (384,400 km) from Earth, sending your vacation or eclipse photos home to family and friends would take a little more than a second. As for recreational activities, the moon's gravity — at one-sixth that of Earth — would make lunar sports a bit of a challenge. A lunar colonizer could jump and throw a ball six times higher and farther than on Earth. In other words, the distance between goal posts on an American lunar football field would need to be 600 yards (549 meters), as opposed to the 100-yards (91 m) fields on Earth, Elphic said. Lunar athletes would not need to check the forecast, however. Because of its very tenuous atmosphere, the moon has no weather. "Every day is sunny with no chance of rain!" Elphic added. You would, however, have to look out for so-called space weather, which includes meteor particles that can be as large as golf balls and highly energetic particles from solar flares. Another potential danger would be moonquakes. Seismometers left on the lunar surface during Apollo show that the moon is still seismically active, and even has rare, hour-long quakes measuring up to 5.5 on the Richter scale. These quakes would be strong enough to cause structural damage to buildings. "So don't leave Earth for your home on the moon thinking you've left seismic activity behind," Elphic said. "Make sure your lunar house is up to code." Editor's note: This is the third in Space.com's 12-part series on what it might be like to live on or near planets in Earth's solar system, and beyond. Check back each week for the next space destination.